This is the latest donut chain in Singapore that is causing donuts fans to go gaga over. J.Co Donuts. It has been attracting long long queues since it opened. This is its first outlet in Singapore. 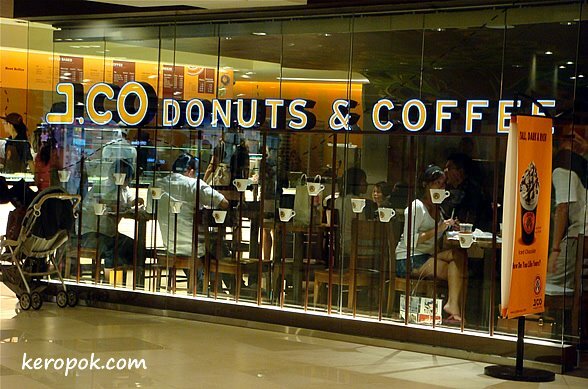 I just found out from its website, www.jcodonuts.com that its from Indonesia. This branch opened in February is franchised by Breadtalk, a local bread company. Are you a donut lover? What is your favorite flavor? did you go to city hall this very afternoon? because i did! i went to shokudo though, not jco. i looooveeee the glazed and the oreo. i'd like to try the jcrown but they seem to never had it. I love donuts, but generally, I just like the plain cinnamon ones. I also like the Dutch oliebollin types. I will note how the font type on the sign reminds me very much of Starbucks! Vade retro satanas! Stay away from the lethal donuts!! Way too sweet for me.